Associate Artist Members: $30 for the first piece and $5 for each additional piece. Non-Members: $35 for first piece and $10 for each additional piece. Entry fees are non-refundable and may be tax deductible to the extent allowable by law. Special Notice: Open exhibition entries are limited to 2 pieces. All other exhibits have a 3 piece limit. Recent pieces (not shown before in EAA Gallery) in any medium, including computer generation and photography. No direct copies, giclees, crafts, commercially produced works or usage of other artists’ works will be accepted. All pieces must be suitably framed and wired for hanging. Canvas paintings must be wired or have intentionally-designed edges if not framed. No "wet" paintings will be excepted. Works on paper must be under glass. Artwork intended to be hung on the wall must be securely wired and may not weigh more than 25 pounds. All works, except portraits, must be for sale. The EAA will receive 25% from all sales. Payments to artists will be disbursed when final payment has been received from the buyer. Selling artists may claim EAA commissions as tax-deductible donations to the extent allowable by law. 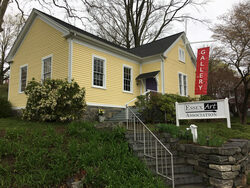 Essex Art Association is required by law to submit 1099’s to the IRS from artists receiving awards and/or sales for amounts totaling $600 or greater during a calendar year. To facilitate this, we require completed W-9 forms prior to giving out award and/or sales payments. Please note that this applies to awards and/or sales from artwork shown at any of our sponsored venues, including: the Essex Art Association gallery; the Essex Corinthian Yacht Club; and the Essex Steam Train gallery. 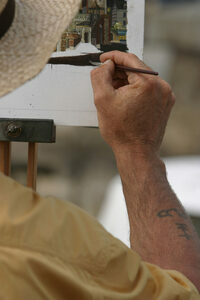 A 1099 will ONLY be sent to the IRS if the total payment to an artist equals or exceeds $600. If not, the W-9 form will be shredded at the end of the calendar year of which it was received. No works (accepted or unaccepted) may be picked up during the Opening Reception of any show. All works may be stored at no charge during the season and retrieved on the regularly scheduled pick-up and receiving days, or during regular gallery hours. Works left at the gallery after September 20th will incur a $15 storage charge. The EAA, Inc. does not maintain insurance covering, and will not assume any responsibility or liability relating to loss of or damage to, works of art while in the possession of the EAA, Inc. By submitting works of art, each exhibitor acknowledges they have been so advised, and relieves the EAA, Inc., its officers, director, and members from any liability with respect thereto.